The Amaze 4G has HTC’s all-knowing phonebook with deep social networking integration. It manages to keep things neatly in order, even though it’s juggling everything from SMS to Facebook photo albums. The entire People app (the phonebook) is tabbed and with more tabs than the stock Android. You have all contacts, groups (including favorite contacts there), as well as a call log. From a drop-down menu at the top, you can filter contacts based on where they came from - the phone's address book, Facebook, Twitter or your HTC Sense account. Selecting a contact displays the basic details: name and photo, numbers, emails and such. That’s just the first tab – the other tabs hold further details and means of communication, including email and a call log. The second tab holds the text messages between you and the given contact in a conversation layout. The third tab is a list of emails you've exchanged with the contact. The next two tabs are what turns the Amaze 4G into a powerful networking tool. The first holds Facebook contact updates, and the other called "Albums" pulls the albums that contacts have created on Flickr and Facebook. The on-screen dialer features a keypad, a shortcut to the call log and a list of contacts beneath (you can hide the keypad). The HTC Amaze 4G has both Smart Dialing and Voice dialing. The device knows some accelerometer-based tricks – turning the phone over will mute the ringer of an incoming call while placing it down starts the loudspeaker automatically when you are in the middle of a call. The other feature is Quiet ring on pickup – once you move the phone, the ringer will quiet down (but not cancel the call). Yet another option is pocket mode – the ringer volume will increase if the phone is in your pocket (the proximity sensor takes care of detecting that). The in-call quality of the device is great. A secondary mic is there to make sure none of the ambient noise gets to your calling party and improves the in-call quality noticeably. 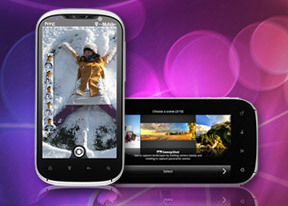 HTC Amaze 4G is capable of handling all sorts of text messaging – SMS, MMS, email. Social networking is covered by several apps and widgets, and there’s Gtalk, which can connect you to Google’s chat network and compatible networks too. SMS and MMS messages are displayed in threads – you see a list of all conversations, each one is listed with the contact’s photo, name and the subject of the last message, as well as a part of the actual message. Tapping a conversation brings up the entire message history with that contact. To add recipients, just start typing a name or number and choose from the contacts offered. Text input is covered by the on-screen custom-made HTC virtual QWERTY keyboard. While it’s still not as good as a hardware one, it’s the next best thing – the 4.3” screen has enough real estate for big, well-spaced keys, which are easy to hit. In case this one doesn’t cut it for you, the Android Market is full of options. Moving on to email, the Gmail app supports batch operations, which allows multiple emails to be archived, labeled or deleted. Multiple Gmail accounts are also supported. The HTC email app can handle several accounts and not just from Gmail. It is easy to set up and quite functional.